To see 2016 data, click here. In this article, a continuation of our American Net Worth series, we explore the net worth it took to be in the 10%, 25%, 50%, 75%, 90%, and 99% (the ‘one percent’) bracket in 2013 for American Households headed by 18-24 year olds, 25-29 year olds, 30-34 year olds, 35-39 year olds, 40-44 year olds, 45-49 year olds, 50-54 year olds and finally 55 and older. 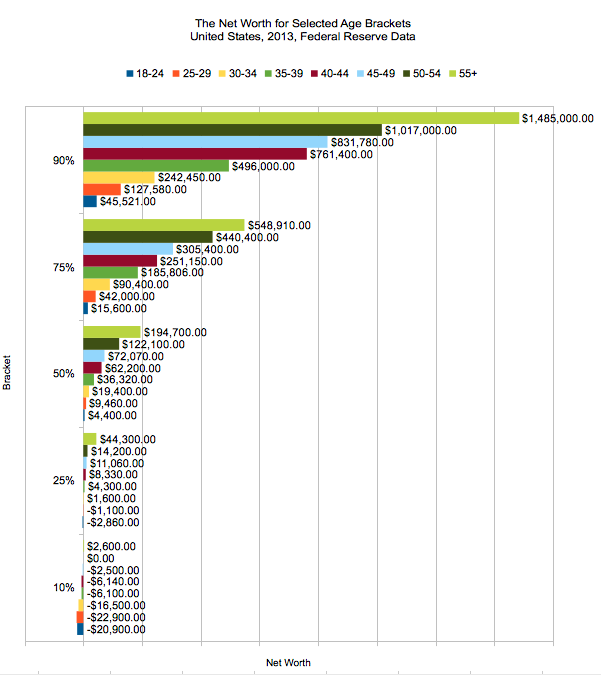 So read on, and enjoy our research on the net worth of age groups in America! This data comes from Federal Reserve Survey of Consumer Finance microdata, and our methodology is discussed in our first piece in the series which covers how income doesn’t predict net worth all that well. In our last piece, we touched on the net worths of the 65+ (generally, retirees) households in the United States. We made a remark that the 65+ household demographic has the highest net worths – and this article fills in the details. First, a table, because we know some of you would like to copy & paste this data – and really, the chart’s a bit stuffy (but colorful!). The top row is the ‘net worth bracket’, and if you trace the age group across you’ll see the ‘minimum amount’ to be in that bracket. Age refers to the age of the ‘primary earner’, or whomever the household listed as the primary for retired households. I know we’re right up against the limits of respectable presentation without me figuring out how to turn it into an infographic. That’s okay – my talent lies elsewhere, so stay tuned for an even deeper dive into the data. At this juncture though, we’re interested in your thoughts on the net worth of age groups in America – how do these net worth numbers line up with your expectations? Where do you fall in your bracket? Its nice to see that I am falling in the top 10% of my age group (25-29). Crap, I think we are going to hit 30 just shy of the one percent in America. I should really check the details on that. If the bar would stay still, I think I would be safe saying we can hit the next one by 34.
is there any way to post the age percents according to solely financial wealth (which includes 401k and retirement accounts?) The SCF has a financial wealth section but not much in the way of age breakdowns. There is an anomaly as you move up the age brackets in the 99th percentile: the 45-49 age group is worth less than the 40-44 group. The only similar anomalies are in the bottom 10%. Is that data point accurate? Any good explanations for that? You should probably just poke through the data on the SCF: http://www.federalreserve.gov/econresdata/scf/scfindex.htm . I don’t have anything loaded right now, but odds are it’s sample sizes and bad luck versus some weird economic anomaly. I plan to reload a bunch of this data into R when I get through with the income stuff; I’m getting a lot of questions about wealth without the age groups and I think I missed the boat on those a bit. Any requests for when I do that?